An extremely good list of open source software. It does miss some other extremely good free software (not necessarily open source), but that's a different story. Interesting Inference/Observation - Ram was 39 years old when he killed Ravana !! Definitely a must read ! Probably the best pulled off technological crimes of the century. It's almost like a gripping novel read. Illegally wiretapped cellphones in the Athens affair included those of the prime minister, his defense and foreign affairs ministers, top military and law ­enforcement officials, the Greek EU commissioner, activists, and journalists. Literally the who's who of Greece. I published a few posts in my humor blog and none of them are appearing at this point of time. Either some cache somewhere in my line of reception is holding onto older content or something is wrong with Blogger. Note that I have a 128kbps ADSL connection via Airtel. So, it's technically not broadband. However, I'm fairly happy with it's quality albeit I still think it's overpriced (@ Rs.699+taxes per month). BTW, has anyone performed such speed tests for a 256kbps or 512kbps connection from Airtel or any other Indian service provider ? If not, can you please do so and let me know (by leaving a comment in here) ? This one in Miami is generally slow, almost always. For a description of my home network, visit the following posts Home Network and Home Network - 2. Gist: 2 laptops, 2 desktops with a linksys WRT54GL (for wireless n/w and 4 port ethernet switch) and DLINK-502-T for ADSL connectivity. The 160MHz machine desktop is likely to come back from the hardware vendor with some I/O chip replaced to rectify the problem with it (hopefully). Now, I'm wondering if it can serve as some kind of NAS - network attached storage. Obviously, it's under-powered in terms of CPU and memory, but it may be worth giving it a shot. I honestly know that I'll get fed up of it in a few moments and throw the junk out given it's possible pathetic performance with just that hardware configuration. At the moment, I don't have any other real "technical/scientific" use that I can put it to. The only thing that still bothers me is that such a desktop will need uninterrupted power supply for functioning without data loss during power outages. And, a UPS is certainly not on top my priority list at the moment. While I really can't vouch for the sanctity of some of the statistics quoted in the article noted below, it does present a good overall picture about direction things are/could be headed in, for India. And, I know that it paints both a picture of despair and opportunity - rightly so. It remains to be seen which of these two gains the upper hand in the long run. I sincerely hope that we are able to capitalize on the opportunity at hand, although it seems to be a really tough thing to do given all the reality on ground. "Good, Must Read" for those interested in India, from BusinessWeek. Some of the things that the US and UK (and probably others) are doing in the name of security have implications going far beyond those that anyone can imagine today. If things keep going at this rate, I wish the lives of those guys asking for such schemes in the name of security are screwed beyond their wildest imaginations. Reminds me of movie theater plots regarding identity theft and crisis. Woe befall these morons who think security will be achieved just by collecting every possible part of the human DNA. Imagine the kind of abuse it can be put to if it falls under wrong hands. Why don't these guys just get it ?!!! Well, this certainly has been one of the worst rant I ever posted on this blog ! Sorry to subject you to this ! People will be required to give fingerprints, biometric details such as a facial scan and a wealth of personal details - including second homes, driving licence and insurance numbers. All will be stored on a giant ID cards Register, which can be accessed by accredited Whitehall departments, banks and businesses. I started using YouTube about two days ago for private video uploads and sharing. I discovered that uploads have been freezing in between ever since y'day. I don't know if this is a function of some inherent builtin limit on YouTube's end (for daily uploads from a single user) or this is some bandwidth constraint imposed by my service provider (Airtel) or something else totally unrelated. I'm however still able to download relatively large files without issues (so download bandwidth may not necessarily have been breached yet, at my current levels of consumption). Uploads to YouTube of files 50MB or lesser have been freezing anywhere between 20% to 70% completion. Anyone else noticed this ? Any known issues / workarounds ? At the moment, I've been unable to upload any video completely since last evening (Saturday, 10-Mar-2007). FWIW, I was able to upload 6 videos in all since I began the whole process. For whatsoever reason, comment notification hasn't been working for me for some time now. Very rarely do I go to "actually see" my site. I'm happy posting, monitoring via RSS feeds if things are coming out ok (haven't been doing this lately) and responding to comments if and when I receive them via the comment notification mechanism on blogger. Recently, I observed that my blog has had a few comments up for a few recent posts and I never received any notification for those. Need to check out what has happened. Either that or my email system has been acting up - I know that the spam classification category has been "very severe" of late on my personal email server and there have been a few genuine email rejects by the system. I've recently noticed a "Report bug" (or was it "Submit bug") link in one gmail a/c of mine while I don't see this on another. Anyone knows if this too is being rolled out in the usual Gmail fashion of a few users at a time ? I wonder what is it that they actually do to do this only in an incremental fashion for most of the features. Is it due to the way their basic system has been designed ? Or are they looking at manageability and/or other things before letting full junta get something new. Of late, for the past couple of days (about a week or so), the amount of spam that is escaping yahoo's spam filters and landing in my yahoo inbox has increased. Although the daily numbers are typically in the lower single digits, it still makes me wonder what has gone / is going wrong and/or what has changed. From a pure technical perspective, is it possible to share unused bandwidth available across multiple independent ADSL connections ? 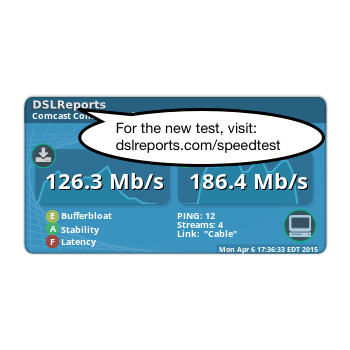 Like, if I were in an apartment complex and everyone (or almost) had an unlimited 128/256kbps download ADSL connection from their service provider of choice, would it be possible in some way to share the total bandwidth across all interested parties ? Note that I'm not getting into the clauses the service provider has for connections, I'm just looking at technical feasibility. Maybe someway of hooking up via some wireless mesh whereby everyone was guaranteed their "assured" bandwidth, but still was able to leverage if someone's else was not being used ? It may probably "break" the assumptions of connection pool sharing being taken into consideration by SPs, but that's another matter. For example, they may assume not more than 10% of their connections will be active online at a given point of time and purchase their backend bandwidth accordingly. Note that I'm also not getting into issues like what is the incentive for someone to get into such shared connections, etc. Thoughts, ideas, known solutions, ... ? Back in Apr-2006, I'd posted my take on Google Vs Yahoo calendar. Anyway, coming back to why this post now, I recently read a Wired review on few online calendars - The Web's Best Calendars. I found Scrybe listed amongst them to have ultra-kewl capabilities. The demo video just makes you drool :) Enlisted myself for the beta, waiting in the queue now ! Back in Dec-2005, I'd written to Gmail support team with a request for enabling Gmail to access POP accounts with other email providers. Not only does it help consolidate my email accounts with Gmail (which may in itself be a good or bad thing depending on your POV), it will also help Gmail in providing more relevant ads for me. The Gmail support team acknowledged that this was something they didn't then have and would pass it onto the appropriate team. Finally, today, I saw that Gmail announced this "feature" availability, beginning with their "usual" partial rollout process. And, I'm one of those lucky few who has this feature enabled in the account already. Understandably, it's only a matter of time before everyone else gets it. Further to my earlier post about the "Home Network", there's been very little progress. I got an external HDD casing from Supreme Computers (in Ritchie Street) over the weekend for Rs.600/- and plugged in my 200GB HDD into it. It's both convenient and cumbersome at the same time - convenient to move, cumbersome 'cos it needs external power. The casing heats up quite a lot - need to read up on whether it's indeed safe to do things this way. I'm yet to figure out how to get tiny holes onto the aluminum casing so that while they do work as an outlet for heat escape, they are not large enough to allow too much dust or insects inside. And, I heard from Supreme Computer folks that it's not easy to get an external casing for converting internal DVD drives to external - their claim is that it's usually ridden with problems. Need to check that out. The DVD writer is currently on a machine with 633Mhz Celeron processor with 192MB RAM and 2GB HDD - certainly not the best location for efficient processing. Next on list is research on actual external HDDs to understand their benefits (safety, reliability, ...). Call it a state of mind ! Back in Dec-2006, I'd written about my problems with Firefox. However, I just couldn't convince myself to stay with IE as my default browser for a long time (Internet Explorer Unsafe for 284 Days in 2006). I must admit that I didn't do proper debugging earlier. While I did do a complete uninstall, deleted installation directories, I didn't bother about the profile directory. Guess that's where the problem was (what/why it was, I don't know). On an average, my 2km drive from home to office (and vice versa) takes anywhere between 10-20mins if it's during regular office hours ! Interesting thoughts on DRM, especially concerning request to open up Apple's iTunes DRM. Definitely worth a read, given all the anti-DRM ruckus in Europe and US ! Around 2 billion songs have been sold via iTunes store, and 2 million iPods (last year). On a global average, hardly 3% of music on iPods is from iTunes store. Rest 97% is non-DRM music. much more than you can ever imagine. Or for that matter any written record ! The law also states that oral statements or commitments are also equally liable in some other contexts, but let's leave that at the moment. Look at Comes et al. Vs Microsoft case where communication from as far as 1991 (or probably even earlier, I didn't look into too many exhibits) is coming back to haunt MS. This doesn't imply that one has to be "extra-smart" while dealing with stuff bordering on what may be considered extreme positions in the distant future. Instead, just try and be good - "do no evil" ! Any good recommendations for download managers that can dynamically change the speed for one amongst multiple downloads ? Say I have 3 downloads, each going at 5.6, 4.3 and 3.2 kBps respectively (maybe from same or different servers). Now, I'd like to raise the speed of the 3.2KBps to say 5.0KBps, but don't mind the other downloads dropping to a lesser speed. Is that possible ? Have you seen/used it ? Thanks to the long weekend, I got a chance to spend some time with a hardware service vendor on saturday in repairing (or trying to repair, as mentioned in my previous post) my two home desktop machines. * Two 20GB HDDs diagnozed dead or not fit for complete use. Now, I'm doing the research on how to salvage those for some kind of use. * One machine's (Pentium II) motherboard is suspected to have problems. Needs more diagnosis by the vendor. I think the two 20GB HDDs conked 'cos I haven't bothered using any sort of UPS for a long long time. Need to get one, I'm looking for recommendations. Keeping my fingers crossed on how the whole thing will turn out and how my home network will look in the near future. What do you have at home ? I've been wanting to do this for such a long time, have finally managed it today !! Running Kubuntu on my computer - just for the heck of it (all those rave reviews have indeed caught my fancy and attention for a long time now) ! My two desktop computers at home are dead for some time now (hopefully getting them repaired this weekend). My home laptop being used by my wife runs Win XP Home and can't be touched for my experiments ;-) Work laptop runx Win XP Pro and can't actually be messed either. However, thanks to Kubuntu's Live/Install CD, I'm right now running the live version of Kubuntu on my work laptop without any problem ! And, am writing this post via it. Ain't it cool ?! Now, to figure out where I'll actually install it. (Will put up the desktop snapshot later). 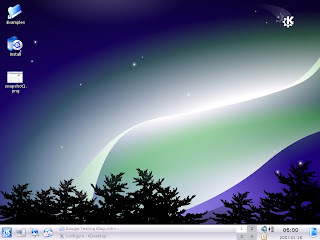 In an earlier post titled "RSS Screensaver" posted sometime in Jun-2006, I'd talked about MSN RSS Screensaver and NuParadigm's RSS Screensaver. A few weeks ago (or prolly more than a month), I stumbled across Newsgator's RSS Screensaver. I like the flexibility that it provides in selecting and managing feeds (integrates with a newsgator account). However, it does miss some of the convenience that MSN RSS SS provides (detailed news about a post, images from selected directories as background, temperature/stock ticker, etc), but is definitely in the right direction. For all those RSS fans out there, go get it ! !